Wash potatoes thoroughly under running water. 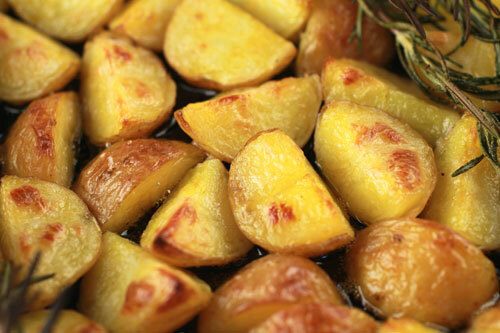 Cut potatoes into halves or quarters, depending on the size of roasting potatoes. 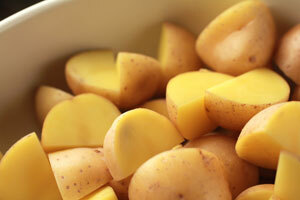 In a medium size pot filled with water, add the cut potatoes. When water starts to boil, reduce to medium heat and par-cook the potatoes. Check for doneness with a fork. Note: Do not overcook, as potatoes will go into oven for additional cooking. Strain potatoes with a colander, move to a mixing bowl. Add Extra Virgin Olive Oil and a few pinches of salt. Mix well. 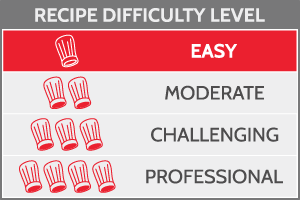 Transfer into a Silpat® Entremet mold. Divide fresh rosemary into 2-3 bunches and tie each with a string. 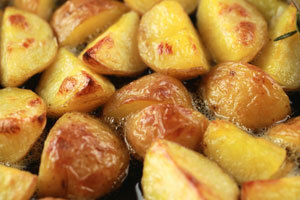 Place on top of potatoes to infuse flavor while roasting. Add remainder of salt to finish. Cook for 15-20 minutes. Check for doneness with a fork. Remove rosemary bunches prior to serving. Perfect as a side dish. Dried rosemary can be used, apply very sparingly.